A day at the beach sounds nice right about now. It’s a little gross and rainy in New England today…but lucky the day we shot our May book (aptly called A Day At The Beach) it was a beautiful day. At first when you think of hand knits and the beach you might think they don’t go together. But that’s simply not true. Take for example our first garment from the book – the Lindsay Dress designed by Kathy North. This is the perfect summer dress for any little girl. Knit in Seedling, it is machine washable (attention moms…easy care!). It would make a great cover-up for beach days or perfect with a pair of sandals for running errands with mom or dad around town. We have shown it above in hand paint, but it would also look awesome in the solid. In fact, we liked it so much in the solid we asked Kathy if she could make an adult version that is a halter top, the Lindsay Tank Top knit in Sprout. Both garments are knit in the round until the armholes and then split for the front and back. You can add the keyhole detail for an added bit of flair on either the front or back, or leave it out completely. I-cord finishes the halter as a tie or purchase a coordinating ribbon to complete the look. These are both great for the day, but if you are anything like me; you like to stay at the beach for as long as possible. And sometimes it can get really chilly after the sun goes down, which usually means grabbing a sweatshirt or long sleeve top. 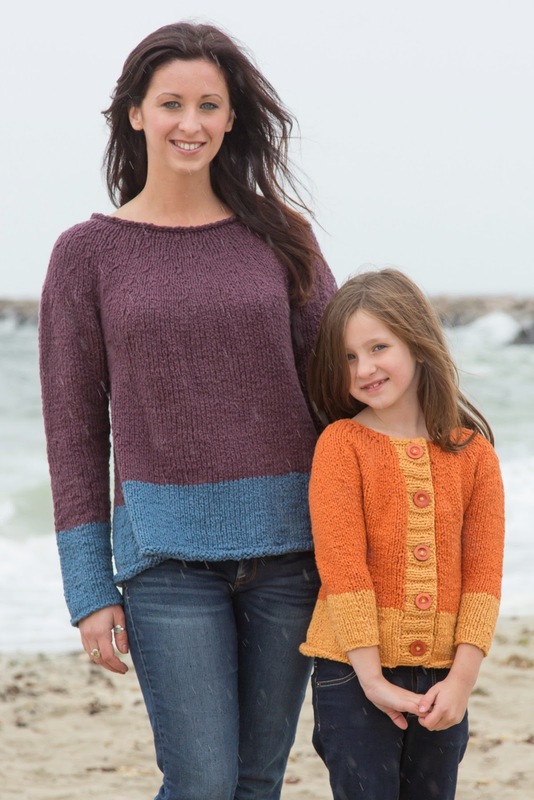 How about our McKenize Pullover and Cardigan designed by Susan Mills instead? With a slight a-line shape and color blocking details these sweaters are more refined, but just as comfortable as your favorite sweatshirt. Knit in Sprout (which is also machine washable) on sizes 8 & 9 US, these sweaters will go really fast! Simple details make them classic knits that you will want to reach for again and again. Both Seedling and Sprout are 100% Organic Cotton and part of our Verde Collection of environmentally conscious yarns, so you can feel good about your yarn choice. There are a ton of colors to choose from in each yarn, so the sky’s the limit! Those of the interesting information you always bring out the best that I know, thanks.